Are you ready to meet your next book boyfriend? 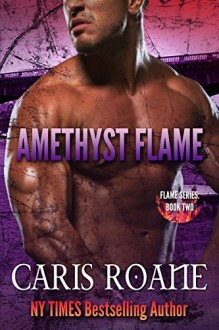 Hunky Nathan Vaughn, six-six, and one muscled vampire warrior, is waiting for you in AMETHYST FLAME. He’s had a lot of trouble in his life and needs a good woman to help even things out. Can you see yourself as Emma, the beautiful witch who believes all vampires are bad, but who can’t seem to resist the call of so much exquisite masculinity? Meet Vaughn right now, in Amethyst Flame, Book 2 of the Flame Series, a standalone story! Vaughn and Emma have met once in the past, the night they rescued three teenage girls from a kidnapping ring. But a vampire and a witch can’t have a relationship in Five Bridges. So, they parted, determined never to see each other again. Emma was desolate, then the phone rang. Vaughn called and kept calling and she kept answering. But the rescue they shared turned out to piss off one very bad wizard who decided they both needed to die. Now they’re in it, fighting to stay alive and working oh-so-hard NOT to fall in love. Will they survive when so much is against this ill-fated couple? Everything you need is in their story. …to finally battling the evil in their world and reaching a happily-ever-after! Of course, there’s so much more to AMETHYST FLAME. You’ll enjoy the world of Five Bridges where several ‘alter’ species live in a cordoned off province in the middle of Phoenix, Arizona. You’ll discover how the different ‘flame’ drugs have taken over the city and threaten to eradicate human life as nothing has before. And you’ll feel the searing heat when Vaughn and Emma ride the flames of passion. You’ll get hours of escape from the sometimes difficult and often irritating chores of life. Oh, yes, and you’ll come away refreshed with a new book boyfriend. So scroll back to the top and grab a copy today because Vaughn is waiting for you! Better hurry, though, or someone else may take him home first!